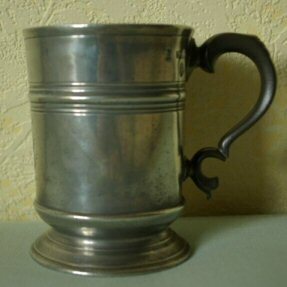 A recent visit to one of Hertfordshire’s historical public houses, The Coach & Horses in Rickmansworth, was a day outing for a pint pewter mug from the Shelf. The mug is inscribed with the hallmarks of the maker Harton & Son whose premises were at Shoe Lane and High Holborn in London 1862 – 1890. Unlike silver, hallmarks on pewter never formed part of an official system of quality control or indeed the exact year of manufacture. However, hallmarks on a pewter piece can help to identify the maker and also establish the period in time when the item was in use. The ‘touch mark’ on an item of pewter is the recognised authentication for the maker although there may also be hallmarks. The pub name is on the external base of the mug, in script which can make it difficult to read, and there is also the verification mark of VR396 (Hertford County) 1882 on, denoting use in a licensed premises during the reign of Queen Victoria. Furthermore, the script initials to the front of the mug could be those of the publican circa 1880 – 1886 of W (William) Burgess at The Coach & Horses as confirmed in the licence records for that period. The Coach & Horses in the High Street, Rickmansworth, stands out among the adjacent modern flats and other recent building developments to remind us that time marches on but some of our social history remains in the shape of a British Pub. The photo of the front of the pub, taken on the visit day, shows the ‘One Way’ sign – perhaps this was used in some former glory for the direction of the horse drawn coaches? Rickmansworth was not on a horse drawn coach main route from London to the North, but there would have been local routes to St Albans via Watford. The pub had little residential accommodation apart from that used by the publican and his family, but was a popular venue for locals and travellers passing through. Dating back to at least 1722, the pub was linked to the Salter family who established a nearby brewery in Rickmansworth and which remained an active business until 1924 when it was sold to the Cannon Brewery Company. 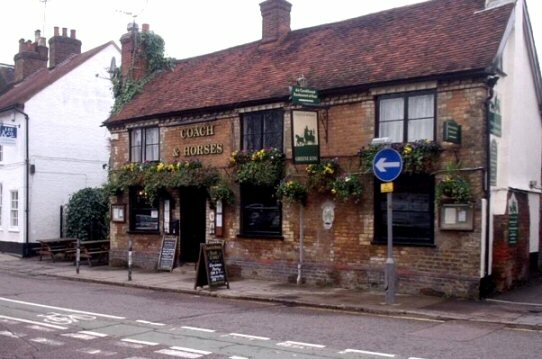 Samuel Salter had bought The Coach & Horses pub around 1741 and the tied pub estate built up in the surrounding Hertfordshire area through his son, Stephen Salter, who succeeded on his father’s death in 1750. Stephen died in 1795 and his son, Samuel Salter II, continued the brewery and the linked public houses. He also extended the business through the construction of a branch off the nearby Grand Junction Canal (now the Grand Union) for the transport of Brewery products into London and points along the way, and returning the empty barrels. Samuel Salter II died in 1829 and in his will he bequeathed to the local people and travellers a daily barrel of beer placed outside The Coach & Horses in the adjoining yard of the Brewery. This free barrel of beer was so popular that the crowds assembling to hopefully partake became a nuisance and it was estimated that some 100 persons would be waiting for it to arrive in the morning, and in a very short time the barrel would be empty. The records show that the Trustees of the Brewery (still Salter & Co) decided in 1856 to discontinue the daily practice in the face of public disquiet! It is of interest that mention was made about ‘the free barrel of beer’ in an article in the Illustrated London News for 11th October 1851, entitled ‘A Ramble in Hertfordshire’. A party of people undertook a walk from Watford (from London via rail) to some beauty spots and when in Rickmansworth, probably thirsty, called in for a free pint. The ILN reporter wrote ‘The barrel of beer given every day by a wealthy brewer of the town to the poor and to passengers has, we found, much to our disappointment, run to its last dregs’. The party continued on its way back to Watford to catch the train back to London; the Metropolitan Line to Rickmansworth was not open until some years later hence the round trip. A busy pub with a diverse menu for the hungry and a good range of ales, but retaining much of its old world charm and character. My pint is back on the shelf, but on its homeward journey it spotted a pub in nearby Croxley Green which it recognised as being the likely home of one of its colleagues, a Victorian Pint, on the adjacent shelf. Perhaps another expedition out in the near future before that pub becomes history!